I take the pictures right off the TV screen, not unlike taking pictures for twitter when Anthony Rizzo hits another home run. It is 5:30 in the morning and I'm watching from the balcony as the sprinklers soak the lawn. It is about to rain in Chicago, so this annoys me. We're all a little sick of seeing so much water. It is all there is on television. In Houston 30,000 people are homeless. Some of us feel bad because we can't take anyone in, and don't have a boat, can't rescue anyone. We cannot stop watching the news. 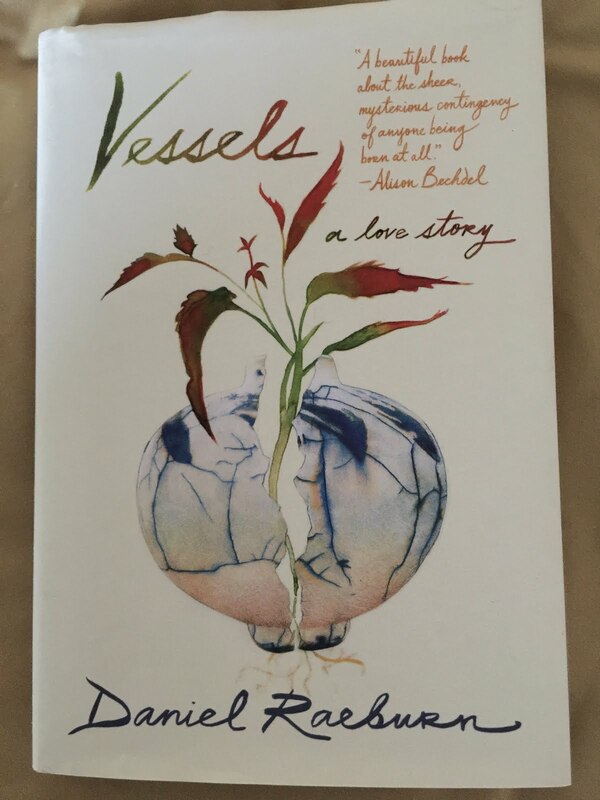 The rescue stories, extractions, captivate and keep on coming. It seems like there will be no end. The rain won't stop and there is no place for the water to go. Houston is flat, concrete, an urban center, not a national park. The water doesn't sink into the ground when it hits the cement. People, like the rain, have no place to go, either. Survivors of other hurricanes, Katrina, Sandy, Ivan, Andrew, Patricia, the list goes on, are reliving, retelling their trauma. Post Traumatic Stress Disorder, a top mental health challenge, will be the topic of therapy sessions in coastal towns across the nation. 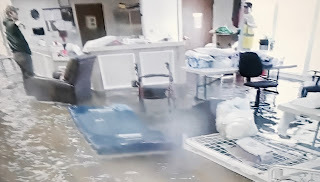 And your therapist just wants to be in Houston, in a boat, paddling around and saving lives. The thought of getting wet isn't scaring her, nor is the hunger or lack of sleep. It is an adventure, a once in a lifetime. After all, she has a home to come back to when the waters settle down. There's the story of a mattress king, Mattress Mack, who is opening his store to the new homeless. Mattress Mack cried real tears during the television interview, told us that these are his people. He doesn't care if they are black or white or where they come from, these are his people. He's in a people business, has sold many a mattress personally, not a guess. He knows regular people who just want a bed to sleep in. Mack modestly explains that he has to do something. His solution will cost him, the damage to the store about $30,000 a day, but he doesn't care. Too bad there aren't more mattress stores. Somebody interviewed a scientist who firmly opined that the storm is due to climate change. It is an environmental storm, and this will become the new normal. There will be many more furious storms in our future. We don't need a crystal ball. Another scientist explains that progress, urbanization has exacerbated the problem. We shouldn't have paved paradise, developed every stitch of land. The water has to run off someplace. It will begin in your basement, rise to the bedrooms. Paving paradise has come with a huge price. My grandfather, who was a farmer, hated the big cottonwood tree in my backyard. He would come over and observe our feeble efforts at growing tomatoes, mutter under his breath. That cottonwood is a nuisance tree. He'd go on, saying that the fluffy seeds get into everything, bring pests, have to be raked up. He doesn't even realize that the cotton is an allergy trigger, that our eyes hurt every spring, and the neighbors hate us, want us to cut the tree down. The tree, the largest on the block, had grown so big they feared a lightning storm would split it, thick branches would smash through windows, the roof, probably mine, but maybe theirs. Who knows which way the wind is going to blow? But razing that tree would cost about $10,000 and FD and I did not have that kind of scratch to throw around. One day a Commonwealth Edison (our electric provider) representative knocked on the door and offered to cut down the tree on their dime. The tree limbs were growing dangerously close to the electric lines. Sign on the dotted line, he said. And with the stroke of a pen we are without the big tree, left with an enormous tree trunk. I love it, am content to sit on it with my granddaughter and talk about life, how it is a highway, with occasional twists and turns. Raindrops. Hearing the story about Houston's concrete issue, how rain isn't absorbed by impermeable surface area, I remembered the reason the great City of Chicago planted all those cottonwoods long ago. Much of the town was built atop swampland. Cottonwoods, very thirsty trees, soak up water. Deep Tunnel construction built under our streets in the seventies took care of what the trees could not. So we never flooded. 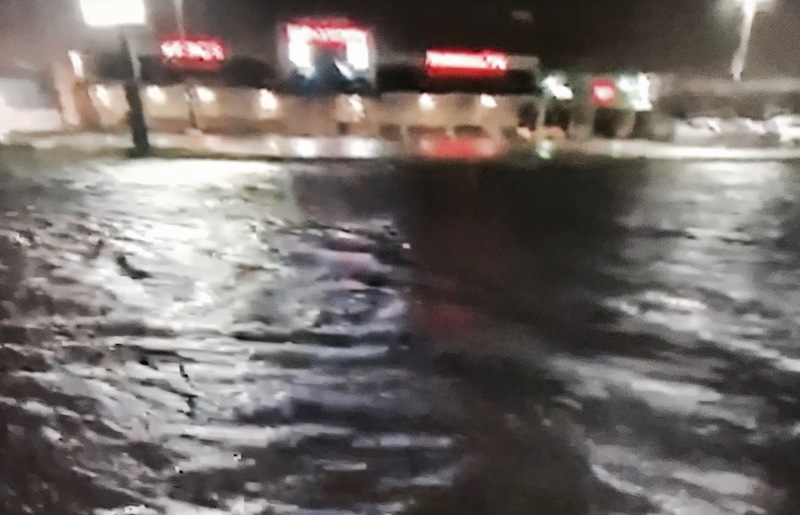 The waters will abate, and people will be relocated. Maybe Houston will be planting trees, but for now, building houses will be the priority. Those of us who get anxious are likely to be very anxious at the thought of a blinding sun. 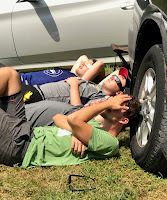 Last week we cautiously awaited instructions about the eclipse: what to do and what not to do. The media tells us that while the sun is still out, and the moon is slowly walking its way across the master orb, during the partial eclipse, we're to wear special glasses. But some say, don't look for very long. Everyone buys the glasses ahead of time. Amazon stocks up, only to find that some venders sold them defective goods. Refunds are awarded, sincere apologies. Entire schools of children disappointed. Class cancelled. Too much panic for this therapist. And it is contagious. Now we have to worry about our own glasses. Are these legitimate? How does one know? Ah! Try them ahead of time. Look up at the sun before August 21. If you see nothing, you're good. So I do that, and to my delight, nothing. There are other unanswered questions, however, more things to worry about. Is seeing totality, when the partial eclipse becomes a total eclipse, really okay to view without glasses? Some of us can't even get over that it is happening at all, a tiny moon, overshadowing the sun, still wondering how that works, exactly. Those of us who've had some physics, or art history, assume it is perspective, but still, too cool for words. This question about viewing with or without glasses is answered during the eclipse. You learn experiencing it, because with the glasses on during totality, you see NOTHING. That's how you know it is totality. Take off the glasses or you miss what you traveled so many miles to see. And again, what about that 3-10 second rule. Is that only during partial? What about Total? So much to worry about. FD is one of those people who knows everything, can answer the Why questions that little children ask. Ask FD, we tell them. He will explain all, especially medical conditions, intelligibly. Or he'll say, "I don't know," but will probably find out. For himself. So I tend not to stress him when he's on a science mission, like seeing totality for the first time ever. This is a big field trip for the doctor, as it is for millions of others, but especially scientists. Having heard that many millions will hit the roads to experience the big event, puts me off, initially. Sitting in a car for 10 hours, competing for gasoline at the pumps, water at the convenience stores, spending hundreds of dollars for lodging in a 3-star hotel, or a residence hall at a state university, isn't appealing. But he finds us a very nice AirB&B at Lake Ozark, only about an hour drive to totality from St. Louis, where we first will greet some relatives. 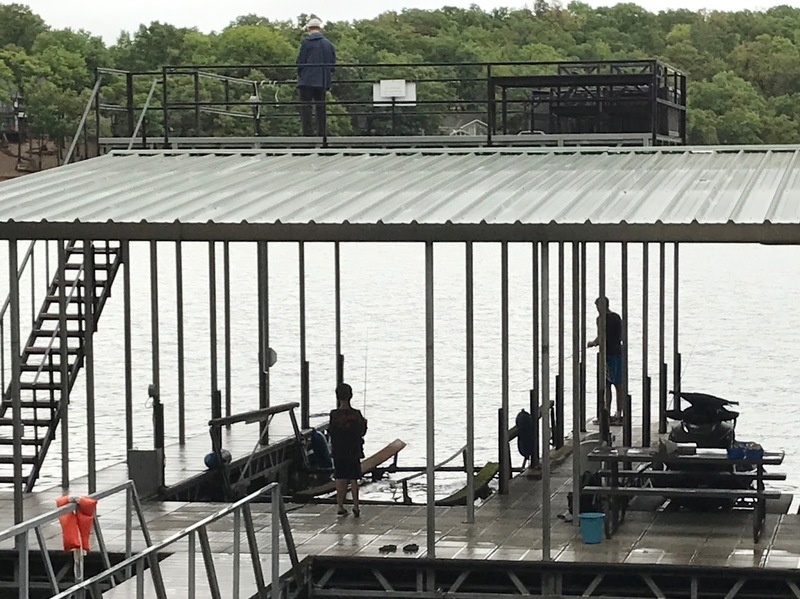 A home on the lake, a pier to fish. This is living. But before we even leave, there is so much anxiety. We have a place to stay, but still have to figure out how to travel. I check flights, find a cheap one one SouthWest to St. Louis, but when FD suggests the train, I pounce on that. Amtrak is cheaper still, brags a large bathroom in every car (unlike the little closets on airplanes), a food car, sockets for electricity in each row. We'll rent a car when we get there. But there isn't a car to be found in St. Louis. Thankfully, my b-i-l has an extra. We take advantage, eat our hearts out with the relatives, then head out to the Ozarks, hoping for light traffic. 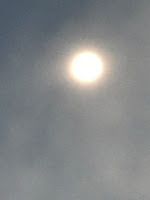 It is amazingly light (this is Sunday, the day before the eclipse), a good sign. There in a few hours, we meet up with my daughter and her family, settle in. We're set to chase the eclipse tomorrow. 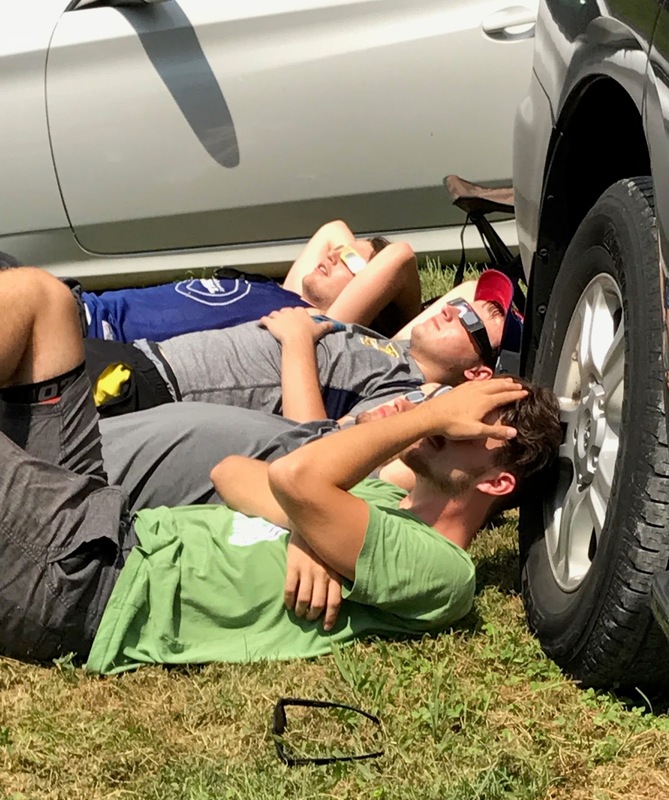 When tomorrow comes, FD wants to leave three hours early, around ten a.m., because he can't tell from the cloud patterns where we'll find totality. He wants to have some flexibility. As we get closer, he's getting very nervous, moves our launch time back yet another hour, wants to leave at 9, and everyone is pretty much ignoring him. He's grousing and grumpy, because no one else is in a big hurry. This is supposed to be a vacation. I ask him where this angst is coming from. (This is a bridging behavior, asking someone to talk about their stress). I HAVE DEADLINE ANXIETY! he shouts. He has made up a new kind of anxiety. WE HAVE A DEADLINE. THIS WILL LAST ONLY A FEW SHORT MINUTES AND THEN, IT IS OVER! True. Thank you for sharing. We decide to get moving, head out on our own, scout out the sunshine, tell the others where to find us. We sing (I sing) Bonnie Tyler's Total Eclipse of the Heart. Together we sing about a dozen other songs, until our voices give out. I haven't seen the research on singing and happiness, or heard any Ted Talks on this, but there has to be an association. Still, even with the singing and Internet radio, classical, jazz (WBGO), whatever we want to hear, this is stressful, because a band of clouds is covering the sky all the way, and the sun only comes out for certain farmers, not others. And what about the dog? (My daughter has a dog). Will he look at the sun? Does he need glasses? Deep thinkers have answered this, tell us that dogs are smart, have no interest in looking at the sun. Ah, but if everyone is looking at the sun, might not the animals do it, too? I text people this question. No one can tell me the answer to this. They are all tired of my panic. 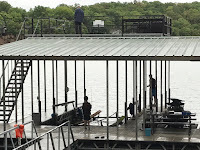 FD finds us a spot in Hartsburg, MO at Katy Trails State Park, lovely, and there are only about fifty eclipse-seekers in this tiny town, locals and nice bikers from all over the country. Katy Trails brags a paved train track for bicyclists, my people, too. We file this information away. Yes. The crickets stopped chirping. Not a sound to be heard. And thanks to FD and his vigilant perusal of the maps and the sky, we see totality for the totality, almost three minutes. 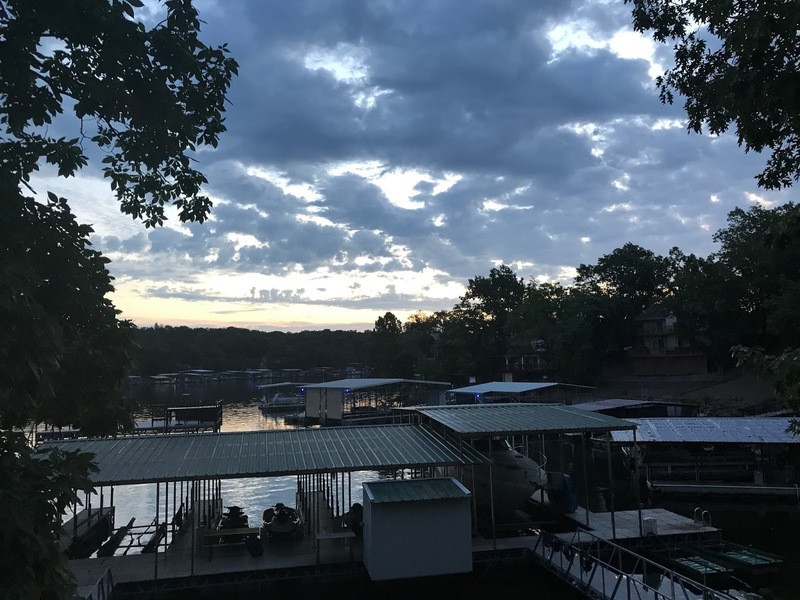 It is breathtaking, and just like at the movie theater, when people clap for the movie at the end, there are cheers and hollers of appreciation punctuating the stillness. All of us in wonderment, awe. And some of us say a prayer, even though in our religion, this is a questionable practice. Sometimes you just have to go with your heart. Jews will not replace us! It is a white nationalist chant heard at the Unite the Right rally in Charlottesville on Saturday. The crowd with the rally permit directs its anger, uniting its right to hate Jews. The other minorities, Blacks, Hispanics, all other persons of color, get a pass for awhile. What is at the core of a personality that drives someone to drive or fly across the country, even don a white sheet, take a torch, or bare-faced, nonchalantly trash talk millions of people he doesn't know to a television reporter? We can assume most people saw Schindler's List, know about the atrocities of the Holocaust, and that most people feel compassion. But no. Not everyone is made of compassion, and some people have this odd gift, a way of detaching from other people, dehumanizing humans. My skin's better than your skin. My genetics are better than yours. To those who work with mental illness, who understand the whats and wherefores, how people become who they are, being racist is a manifestation of fear. The media likes to use the word hate. Crimes like this one fall under the very worst hate crimes. But hate is, at its core, fear. I fear spiders; I hate spiders. (Spoken with real emphasis, conviction). I fear mosquitoes, they bite; I hate mosquitoes. (Ditto). I fear snakes; they bite, too; I hate snakes. I fear Jews (unconsciously, for that would be a sign of vulnerability); they seem so successful, they are everywhere (they are 2% of the US population); I hate Jews. Thought follows a emotion, although it can go both ways. Not so complicated. Add another CBT tautology, another emotion, jealousy. Fear is at the heart of jealousy, and jealousy loads heavy into this equation, too. Fear, add jealousy, equals hate. For example: I might be fearful that a particular person is trying to steal my husband. I'm jealous if my husband pays attention to her. I tell my friends: I hate her. In Charlottesville, James Alex Fields, Jr., rammed his car into a group of counter-protesters, people who took offense to the white supremacist display of hatred towards minority groups. Because in the end, white nationalists didn't only come because they hate Jews, they hate anyone whose potential success and power scares them. 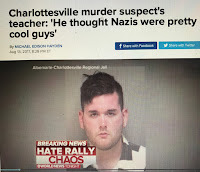 Heather Heyer, only 32, murdered because a man feels he has to make a statement, flex a muscle (foot to pedal), get some respect from the gang. Fields thought the Nazis were really cool, he once told his history teacher. Some of Fields' classmates at the school recalled a trip to Europe after graduation in 2015, when they visited the Dachau concentration camp. Two of the students on the trip said (that) when they arrived at the concentration camp, Fields said, "This is is where the magic happened." Weimer (Alex's history teacher) noted that Randall K. Cooper High School is not particularly diverse, and said that as a result, he didn't have many opportunities to see Fields interact with many non-whites or Jewish people. So that's a reason to hate people, lacking personal exposure, ignorance. We know this, that if we put Palestinians and Israelis together to talk and get to know one another as people, there is understanding, friendship, detente. But Field's friends weren't exposed to Jewish people either, and we don't hear about them coming to Charlottesville. A better explanation, beyond the theory about fear, is that Fields is a sociopath, based upon his comments to his history teacher. He has an idol, Hitler, and thinks that murdering Jews in Europe was a great idea; the Holocaust, a time of history magnificent, brilliant. The idea gets him high. Sociopathy, law-breaking (murder is universally taboo) feels good to a sociopath, really good, especially if you can justify it, benefit. Having this diagnosis one need not even have the need to dehumanize the victim, or blame him for something, it just feels good. No guilt. But he did look nervous in the videos taking him off to prison. 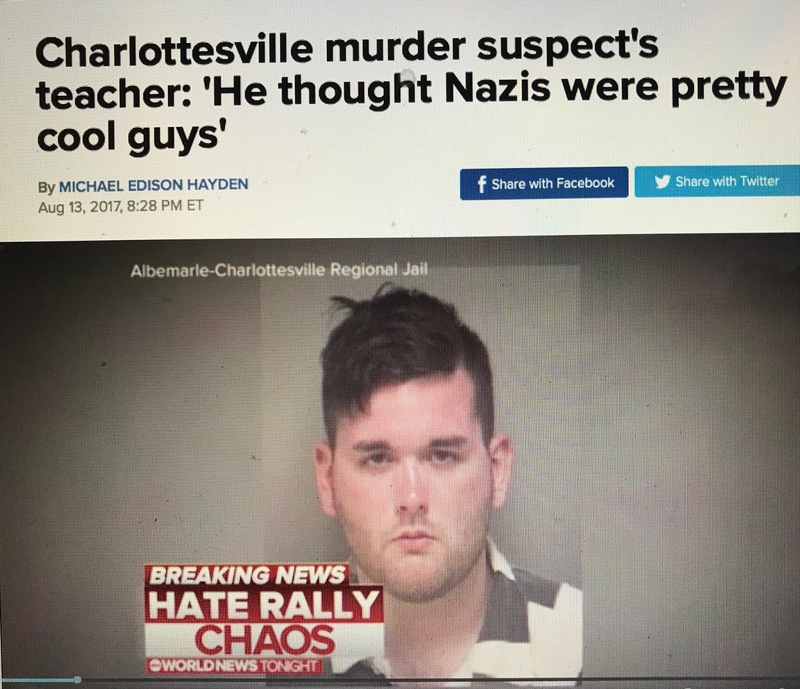 The larger lesson of the rally in Charlottesville, and the probable reason for the crime, assuming Fields has no other big or little crimes under his belt, signs of sociopathy, lies in the very same reason that most other white nationalists also came to town, passively encouraging Fields to do his thing. We're back to fear. The chant about being replaced, WE WILL NOT BE REPLACED has its genesis in the fear of being replaced, replaced at the top of the social pecking order in this country. The business about he statues is just a good excuse for a meeting, exposure. Their psychology is that if people of color are given opportunities, they will excel, reach the "top", take what is not rightfully theirs. If ethnic and racial minorities are accepted in this country (and even the sexual minorities, gays and lesbians, transgendered, etc., are accepted now so anything can happen) their talents and drive for education, gumption and initiative, will likely push those who have fewer talents, less drive or imagination, down the economic-social-political ladder. People of color (and Jews) who make block-buster movies, earn high salaries in television and music, find executive positions in business, finance, are stealing them and must go. And we cannot have any more of this. We have too much of it already, in the form of the Jew. This rant goes on, sorry, but there is so much to say to stop now. Last night I heard a white nationalist express genuine disgust that the beautiful daughter of the president married a Jew (what he must think of her conversion to Judaism, we can only imagine), Jared Kushner. Kushner has what this man certainly wants, a beautiful woman, who is now the president's daughter. So Jared has money, power, and a woman who is not rightfully his, according to this logic. He's not deserving. The white nationalist is surely jealous, would love to take Mr. Kushner's place. Feels replaced. Jealousy is at the core of his hatred. He is afraid that he will never make it in this world as long as there are people like the Kushner's taking his place. It is irrational. This is a big, wide, plentiful nation, and with any interest, anyone can get higher education, jobs, status, success. There is room for everyone in this country to succeed, no cap on how much talent and brain power the society can sustain. How un-American to think any other way. If I personally could interview the men carrying torches, Uniting the Right, brazenly hating, I would ask different questions. Do you think you got enough love as a child? Was there laughter in your home? Did you, as a family, enjoy relative harmony? Was there music? Did you sing? Did your parents welcome others to their table? Did you feel understood? Do you think you had quality time with your parents? Did they sit and read to you, hold you, tell you to love others, to give to others, and that you would be happier in life if your worldview came from a place of love, cooperation, with all people, even people unlike yourself? Especially with people unlike yourself? Did they tell you that we are 98% alike, when it comes right down to our DNA, and that most people are lonely and could use you as a friend? Or was it more like child abuse and neglect, lots of beer, drugs, whiskey, sexism and all the other isms, domestic violence, blame, scapegoating others for problems? There will always be others to blame, if you look for them, and minorities are traditional favorites as scapegoats. We can only hope this will change. Romantic Violence: Memoirs of an American Skinhead. I think ultimately people become extremists not necessarily because of the ideology. I think that the ideology is simply a vehicle to be violent. I believe that people become radicalized, or extremist, because they're searching for three very fundamental human needs: identity, community and a sense of purpose. This makes all the sense in the world to me. Preaching hate and violence is the language of bullies, and bullies are people on the hunt. They need to displace negative feelings like self-doubt, loneliness, poor self-esteem. They identify with the aggressor, often a parent, sibling, neighborhood gang members, to feel better about themselves. Better to be the one on the top, than on the bottom, in the scuffle. 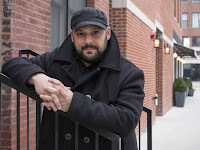 It is a need for power, strength, community, a need Mr. Picciolini felt before he became a skinhead, a neo-Nazi. About negative self-comparisons to others, therapists ask: Why would you do that? You're special. You are you. You are important. You don't have to be anyone else. A person only has to watch the movie The Help to key in on on these words, to remember why they are important. We never have to compare ourselves to others, we only have to be our best selves. That is all we have to be, ultimately, to have it all. . . .Jeans, Lipstick, the Ballpoint Pen, Contraceptives, Instant Coffee, Television Remote Control, Traffic Lights, Scotchguard, the Flexistraw . 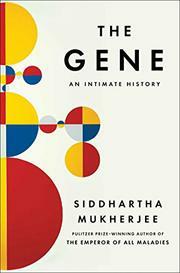 . . God, Genetic Engineering, the Nuclear Chain Reactor, Virtual Reality. . . .Hollywood, the Sit-Com, the Long Playing Record, Woodstock, Sound Movies, Videotape, Color Television, Instant Photography, Holography, Monotheism, Psychoanalysis, the Theory of Relativity, the Weekend (Shabbat), Capitalism, Communism, Circumcision, Cheesecake, Cafeterias, Discount Stores, Pawn Shops, the Shopping Cart and the Ready-to-Wear Clothing Industry, Prozac, Valium, The Polio Vaccine, Radiation, Chemotherapy, the Artificial Kidney Dialysis machine, the Defibrillator, the Cardiac Pacemaker, Vaccination against the deadly “Hepatitis B” virus, the Vaccinating Needle, Laser Technology, Google, the Wire Transmission Facsimilie (FAX) , the Microphone, the Gramophone, the Microprocessing Chip, Optical Fiber Cable, Laser, Cellular Technology, the Videotape Recorder. . .Drip Irrigation, Scale Model Electric Trains, the Pager, the Walkie-talkie, Refrigerated Railroad Car, High-vacuum Electron Tubes, the Incandescent Lamp, Kodachrome Film, the Blimp, the Adding Machine, Stainless Steel, Tapered Roller Bearings. And worse yet, they keep getting Nobel prizes. At least 178 Jews have been awarded the Nobel Prize, accounting for 23% of all individual recipients worldwide between 1901 and 2008, and constituting 37% of all US recipients during the same period. In the scientific research fields of Chemistry, Economics, Medicine and Physics, the corresponding world and US percentages are 27% and 40%, respectively. (Jews currently make up approximately 0.25% of the world’s population and 2% of the US population). A very different book, All Our Waves Are Water. Journalist-biographer-resident surfer, and guru, Jaimal Yogis (he might shudder to be referred to as "guru", a modest man) is on a quest. Jaimal takes his mind's-eye with him, his awareness, and ramps it up, as he journeys through life, a search for his best self, and more than that, he's running away from a bad break up. It is a physical journey, and an inward trip, too. 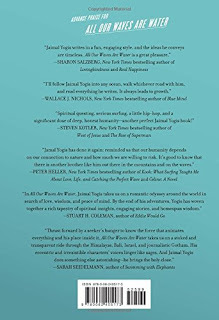 Having one parent of Jewish ancestry but raised in a Buddhist tradition, it is no surprise that a stream of guilt is laced into the words of this delicious biography. I look forward to reading his other book, Saltwater Buddha. All Our Waves Are Water might be a metaphor, but is probably what every surfer is feeling while finding his way in the ocean. There is an attachment to water, detachment from all else, as it must be, because anything else, and down you go. Fall off the board, hit a reef, good for no one. So unconsciously, unknowingly, every surfer is something of a Buddhist surfer, at one with the water. It may the same with skiers like Kristen Ulmer, who wrote the thought-provoking Art of Fear. (I was a little hard on her in the review, but she's totally got a point, even if it isn't new, that we have nothing to fear but fear itself. Skiers, back to the point, are at one with the snow. Not so different from swimmers. In my imagination, we swimmers all share the wondrous feeling of weightlessness in water, the unbearable lightness that our heavy human bodies attain, floating (or riding) atop of it. Unless you have flying dreams, there's no better way to feel it, save becoming practiced at meditation, which takes years. But swimming is easy, and relatively cheap, as surfing must be, excepting the occasional payout for a new board, or neoprene shirt, or trip to Thailand or Hawaii. (We'll talk). So I relate to Jaimal because he is surfer, and as a woman who makes it her business to find a pool, be it salt or chlorine, finding a swim, common knowledge, isn't hard to manage. Unless the pool is closed for some reason, which can be infuriating, which may or may not be Zen-like, depending upon your master. More than likely, anger is tolerated, even encouraged, also good. Jaimal's best friend, a Bali monk, about a depressive episode: This too, good. 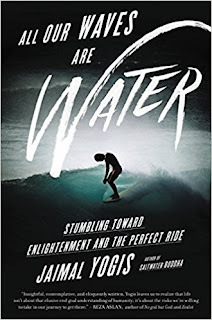 All Our Waves Are Water, aside from being about the oneness between our bodies, mostly water, and all of the water in the sea, the ski, also promises words about enlightenment, and who doesn't want to explore enlightenment? Even if it only to quiet us down, meditation is the cheapest form of bio-feedback around. We talk about it, achieving serenity, but Jaimal walks the literal walk, travels the miles, to find his answers. 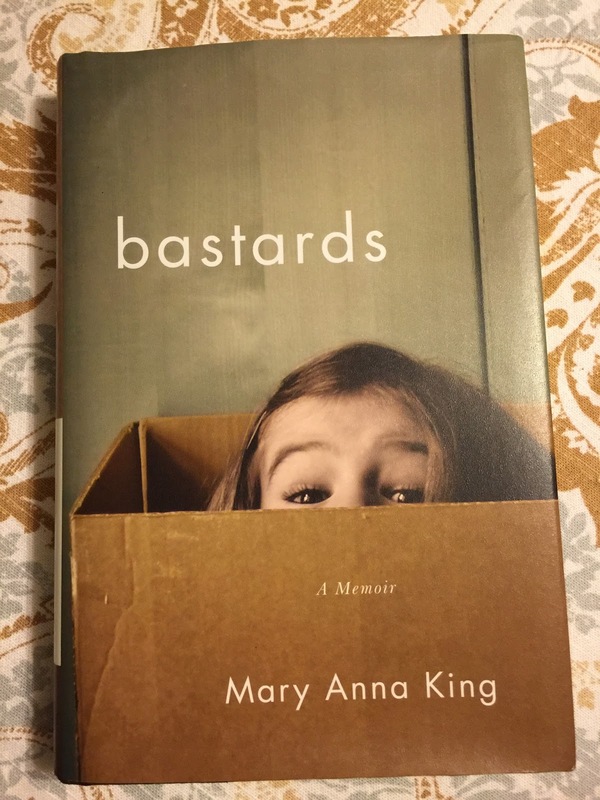 We'll like this author because he's not a rigid guy, or even particularly messed up. The journey, as most trips go (just wait for this weekend's trek to see the eclipse in totality) is stop start. Find one master, switch gears, work an internship for school, meditate on the fly, get on a plane, find another master. Start the journey, fall off course, get back on, lose focus, find it again. And relationships will be at the core of everything, learning and love. Being in contact, attached to people, loving them is very much what enlightenment must be about. And always, always, look for the next wave. 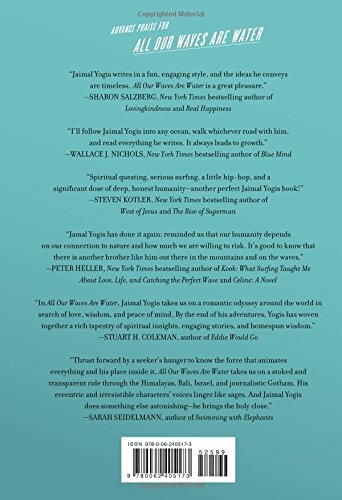 The metaphors about water, waves, bring meditation into the non-meditator's world, the world beyond introspection, more accessible than repeating a mantra. We each have a zen as we walk, run, surf through life. Being here now means being between yesterday and tomorrow, which is impossible, so meditate on that. If you liked Eat, Pray and Love, you’ll like All Our Waves Are Water. A winner. Take Jaimal to the beach with you. Watch the waves.